Radial aggregates of acicular crystals of Aurichalcite on limonite matrix. They are very bright and have a very vivid greenish blue color. 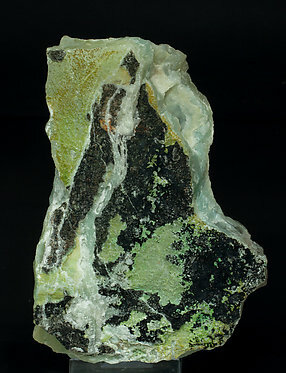 Green microcrystalline Aurichalcite films on banded Calcite with a very slightly green color due to the presence of inclusions of the same Aurichalcite. A very uncommon sample, because well differentiated exposed Aurichalcite is very scarce for the locality. 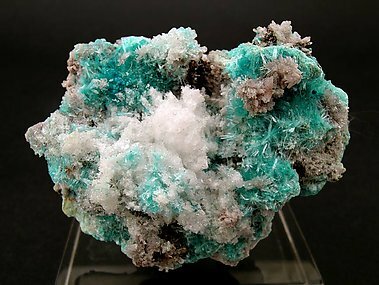 This Aurichalcite has good color quality, but draws specially our attention the paragenesis with Gypsum crystals on the central part of the specimen. It comes from an old collection and we add the two labels. 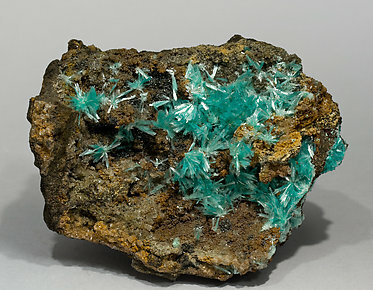 Radial growths of acicular crystals of Aurichalcite with a deeper color in the center and clearer on the crystal terminations. 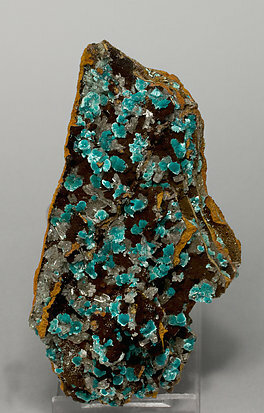 They are on a limonite matrix, with fanlike aggregates of colorless and transparent crystals of Hemimorfite. 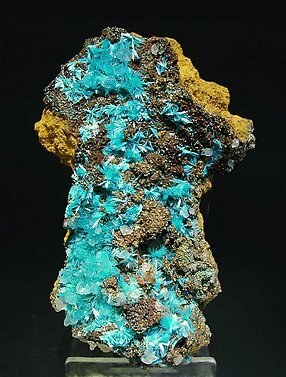 Groups of fan-shaped acicular crystals with intense color, between blue and greenish, on a Limonite matrix. A very pleasant and luminous specimen from a classic locality. Very aerial rosette aggregate of laminar Aurichalcite crystals, with a gentle blue color and silky luster. 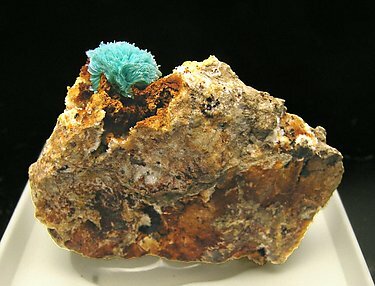 On a vug coated by small Quartz crystals which are covered by an orange and black layer; and with Limonite that enhances the Aurichalcite contrast. New find from a quarry of the historical Troya Mine, currently it is flooded and collapsed.